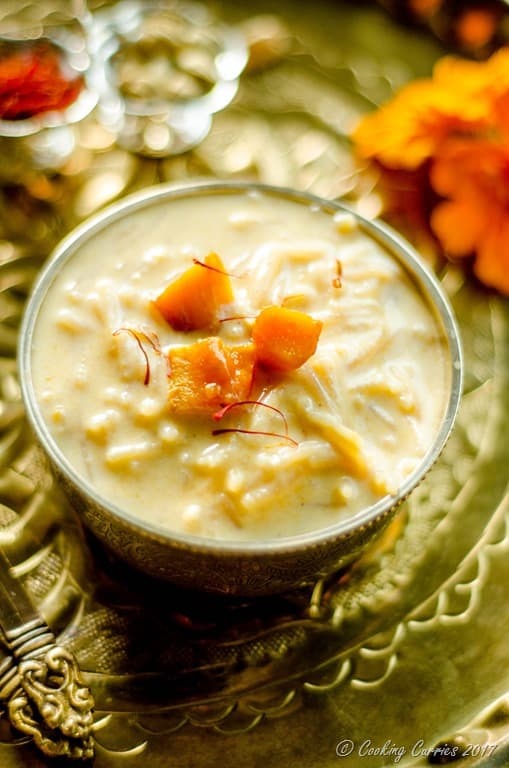 Sweetness of mangoes accentuates the flavors in this simple yet very delicious Semiya Payasam. 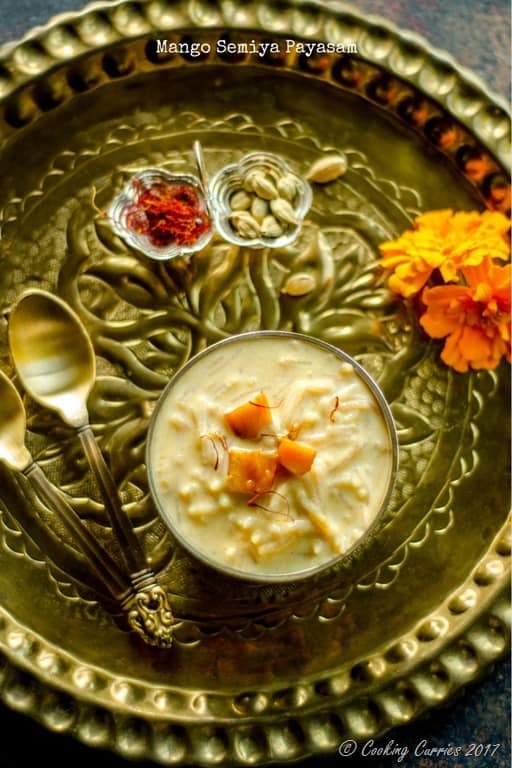 Try this Mango Semiya Payasam as something different from your regular semiya payasam. If you are a South Indian or ever been a part of any Southern Indian festivities, you must have come across Semiya Payasam – a vermicelli milk pudding. It is so easy, so very common and really loved by a majority of people out there. For the plain and simple Semiya Payasam recipe, you can check out my recipe here. I have also made a variation to it with this Carrot Semiya Payasam recipe. 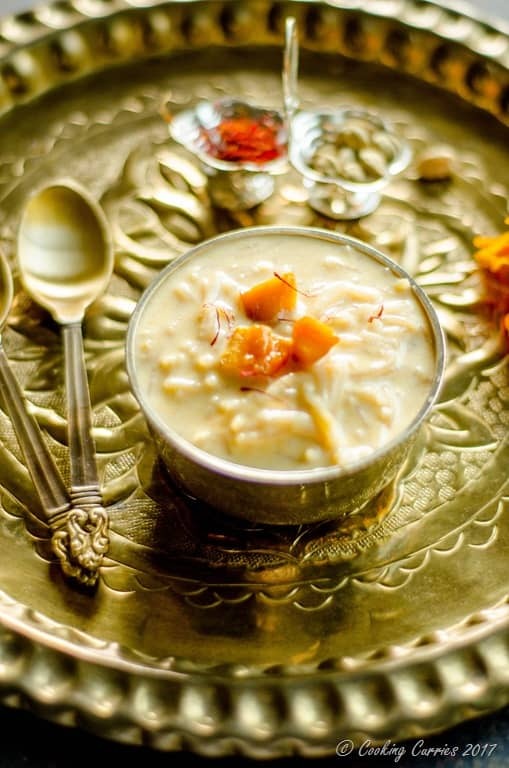 This Mango Semiya Payasam recipe is my third variation to this very popular recipe. One reason why this is so very popular is because, the vermicelli are small noodles and that somehow seems to entice the younger folks a little and it is also so much easier to make than any other payasams because, the semiya cooks really fast and you can make it in about 15 mins, if you want to. 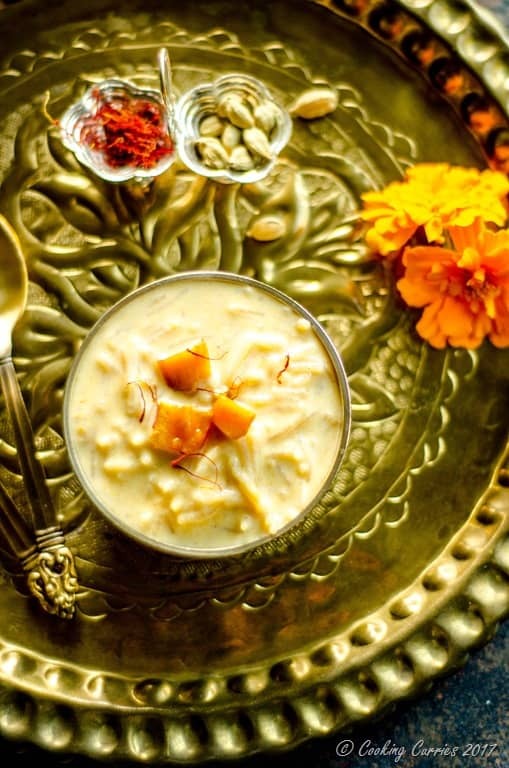 Without further ado, lets move on to the recipe for this Mango Semiya Payasam. Heat the ghee in a heavy bottomed pan and add the roasted semiya bits to it. Roast for a couple of minutes. Add milk and let it come to a boil. Lower heat and let it cook for a few minutes, till the vermicelli softens really well. Add the mango puree to it and mix well. Add the sugar as well and mix well. Crush the cardamom pods and add it to the payasam and top with saffron. Mix it all in very well and cook on low heat for just a couple of minutes.